I'm liking this more and more, the packout for thanksgiving illustrating the why. I'd claim it's bc I'm traveling w/3 women, but the right side is tools, recovery gear...& long guns. I think the Mantec would be great if my wife allows me to purchase my very own LR4, but for our one do it all family vehicle the BROG is the answer. I plan on ordering a mantec. It seems like they are coming out with a second version that works with the factory cargo barrier. (They seem to call it a dog guard.. but i thought that was the left/right split option you add on). -Sourced BROG attic, the usual very fast customer service & shipping had the well crafted VA made item in hand in short order. The runner itself; overall length of the aluminum is 22", as you can see with bends on either end to accomodate roofline with bolt plates affixed to give the attic a place to tie into. The cut out accomodates the rear cargo area lights. The two come together, I decided to rivet them to keep clearances tight, no comments needed on how horrible the holes for the grab handle inserts are...I was working quickly and it was cold. Mocked up further, test fitting the handle several times throughout ensured a quicker install later. You will need to source bigger screws to give you purchase for the grab handles, I had some spares from other Rovers that I sacrificed. Up in the truck, illustrating (perhaps) better why I went to two pieces and had to bend and such. Another shot of it in place. As the initial comment notes, this is a beta to have it in place as we pack the truck up (you can see that is already underway from the first shot) and head up to WV for Thanksgiving. I wanted to try it out and buy myself a little room. At present, all that is up there is a jacket, a poncho liner (in an eagle creek cube), a lightweight camera tripod (that will come down before we drive) and a towel. When we get to WV and I get the chance to do some maint on the truck during the holiday it will likely get pulled down and the metal will get painted to match the headliner. Initial impression is positive; the runners provide enough stretch to make it fit the area well and in conjunction with the BROG 550 cord it keeps the objects tucked into that unused cavity well without blocking the rearview much, if at all. I may do some minor tweaks but I can say without a doubt it will have some utility in an area that is otherwise not really used. Any chance you can post a dimensional drawing of the runners so I can try to make one myself? So I'm a long way from good drawings these days, but here's a sketch I'd done for myself to have the dimensions on hand so I could re-install my setup and still be able to make them for others if they desired. I'm not going to go into BROG LR3 attic runner business so it isn't proprietary to me that's for sure! Major moving parts: 2" by 1/8" aluminum flat stock is what I used, the runner component is 22" long. Within that 22" the bends are at 1 1/4" from each side. The cut for the rear cargo area light is 5 1/2" from the end (or 4 1/4" from the bend). I'm setting that inset at 3" and 3/4" deep; the good thing about the runners is you can do that 2x on the flats and then the important part is being sure to bend one flat one direction, the other the opposite so they fit into the roof well. The other piece I didn't make a drawing of really; it's an 8" section of the 2" x 1/8" stock and then I hand draw on the asymmetric holes for the grab handles (all the grab handles appear to be more/less the same-I currently have my driver seat grab handle out for the runners I have in motion now with the attic actually up in the back of the truck. Cutting those holes is the long pole in the construction tent. At least it was/is for me. It's a PITA. After that mating the two together is best done by mounting the grab handle piece, using some longer pan head screws, and then marking where the runner lines up to ensure the cut out is aligned against the cargo light, etc. Remove everything, rivet, reinstall. Follow up from my long-winded, picture intensive, posts regarding the BROG attic as an alternative. My able assistant and I then took the bold step after trying it on one side of doing the other two, and cutting/sealing all the ends vice having a bunch of 1" webbing taped up but unsightly. So overall I spent a lot of time chasing the perfect mousetrap-in my opinion-to end up almst back where I started when I had bolt plates on there to run the attic's strapping through and just hold it in place with a triglide. That said I do like the grommets being held in place with stouter hardware and at $100 I don't mind cutting the straps. In theory taking it in/out quickly would be nice but I realized perfect was the enemy of good enough for my needs since I rarely have people or cargo back there where that would really be needed (and worst case its soft, just push it up!). Two pair of runners, outbound to board members-hopefully my artisan (meaning homemade) fabrication skills are up to snuff! What color and brand spray paint did you use? Krylon Khaki (the camo flat paint color from Wally World). Much aloha and mahalo to RayG for making a set of runners for my second BROG Attic. 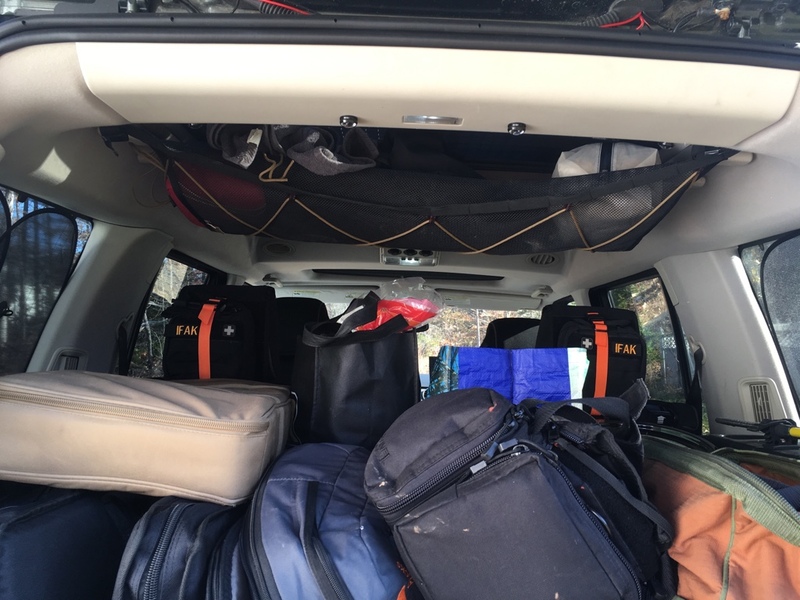 Does the job it was intended for and makes our rear cargo area much neater and convenient! Very cool, nice to see them in action and glad you are happy with them! Setup looks good.